It’s been two years since the release of Devilment’s debut album ‘The Great and Secret Show’. I’m guessing that most people (myself included) first discovered the band after reading about it being ‘a side-project’ of the Cradle of Filth frontman Dani Filth. The band was formed in 2011 by the guitarist Danny Finch and a group of friends in the town of Ipswich, England. Then a little later Ipswich resident, Dani Filth joined the ranks. Fast forward five years, a few line-up changes and the so called ‘side-project’ has developed into something far more serious. Since the success of their debut album, Devilment has been touring and this year their second opus ‘II – The Mephisto Waltzes’ saw the light of day. I think that the biggest mistake that anyone can make with Devilment is to compare them to Cradle of Filth. Whilst both of the bands feature Dani Filth on vocals and share a fascination with horror themes, the similarities end there. THIS IS NOT CRADLE OF FILTH. You won’t find too many tales of Victorian Gothic horror here or lyrics such as “Evening minuetto in a castle by the sea.” What you will find though, are several references to horror movies, modern horror literature and art – most notably Alfred Hitchcock and Stephen King. The surrealist artist Salvador Dali is also mentioned in one of the bonus tracks on the limited edition. Hitchcock Blonde caught my attention even before the album was released thanks to the creepy video. The song itself is an entertaining piece of keyboard-heavy melodic metal with a touch of humour in the lyrics. They even went through the trouble of mentioning the names of the blonde actresses from Hitchcock’s films. Similar things can be said about somewhat Gothic-sounding Dea Della Morte; another song filled with horror film and TV show references . If you are looking for something more profound, perhaps with a touch of dark poetry then Full Dark, No Stars is the track for you. It’s a truly beautiful song which highlights the vocal talents of singer/keyboard player Lauren Francis whose angelic voice provides the perfect contrast to Dani’s harsh vocals. Not all the songs are melodic and keyboard-driven though, for example Shine on Sophie Moone picks up the pace with the drums and the thrashing guitars glaring in the spotlight. This is by far the heaviest song on here. It is also the most complex one treating the listener to a wide range of styles ranging from the fast and furious, to the melodic via an experimental part in the middle. In summary, Devilment have clearly had lots of fun composing and recording this album. No matter how dark and sinister the lyrical themes become, the music has a certain playful tone to it. As far as genre definitions go, it’s a total mish-mash – Gothic but not overly theatrical, symphonic but never quite reaching the orchestral let alone operatic level; with hints of groove metal and a slight experimental flavour added in just to keep you on your toes. So if you dare to dance with the devil then it’s time a for a waltz with Devilment! 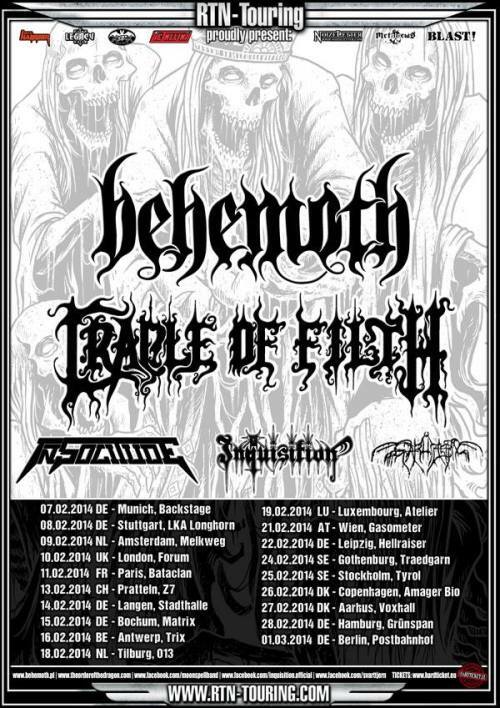 February 2014 will see, Polish metal overlords Behemoth and British extreme gothic act Cradle of Filth, two of the most iconic extreme metal acts of the modern era, unite on a co-headlining tour around Europe. The European crusade will take the two bands to London at the HMV Forum on 10th February for an exclusive UK show. The tour itself will take the two metallic titans through Belgium, Germany, Sweden, Denmark, France and Luxembourg and a few other locations. We are immensely proud to start promotion of The Satanist on the release date of the album in such a noble company. It’s been a while since we toured Europe for the last time… The wolfpack grew stronger and hungrier and with new opus and stage production we have so much more to offer. This European crusade will be the catalyst of 2 years long tour so keep your eyes open! This reign of darkness will be opened by Oslo based Svarttjern and the rest of the line up is completed by, Swedish heavy metal veterans In Solitude and Colombian black metallers Inquistion. Dani Filth, the infamous frontman for the UK’s extreme gothic act Cradle of Filth, has joined British band Devilment. Originally formed in 2011 by Daniel J Finch, in what is described as a “bout of religious delirium”, the band’s line-up consisted of Simon Dawson on drums (Steve Harris, ex-Dearly Beheaded), Justin Walker (13 Candles) handling bass duties and Kieron De-Courci (ex-The Voice) on keyboards with the band experiencing a number of problems holding down a permanent vocalist. Dani Filth originally entered and agreed to help out on a couple tracks which then turned into a studio demo. With the departure of Dawson, Walker and De-Courci, Devilment collected Nick Johnson on bass, Dan Jackson on guitar alongside Aaron Boast on drums. Cradle of Filth have revealed the track list for the band’s upcoming 10th studio album, The Manticore and Other Horrors, due out October 29th (Europe) via Peaceville Records and October 30th (North America) via Nuclear Blast Records. Recorded in eight weeks at both Springvale and Grindstone studios (where it was also mixed by Scott Atkins), Suffolk, the album is a testament to the longevity of The ‘Filth, as not only does it reek of Cradle’s (feared or revered) brand of delicious metal vamperotica, but this thoroughly modern album places the band firmly in fresh killing fields anew. The Manticore and Other Horrors itself possesses an altogether new atmosphere for the band, incorporating a heavier, faster NWOBBM punk vibe that is both current and cruel, blended with ornate orchestration and the quirky immediateness of 2000’s Midian opus. The album’s title can be likened to a bestiary, a collection of stories on monsters – personal demons, Chimeras, literary fiends and world-enslaving entities to blame but a few. Cradle of Filth are set to release their new masterwork The Manticore & other Horrors this Hallowe’en on Peaceville Records. The title of this, Cradle Of Filth’s tenth studio full-length, can be likened to a bestiary, a collection of stories on Monsters; personal demons, Chimeras, literary fiends and world-enslaving entities to blame but a few, Manticore being the ravening title track. It is a song about a beautiful mythological horror that comes to be feared as the disfigurehead of foreign occupation in the Indian provinces. The album itself possesses an altogether new atmosphere for the band, incorporating a heavier, faster NWOBBM punk vibe that is both current and cruel, blended with ornate orchestration and the quirky immediateness of 2000’s Midian opus. Recorded in eight weeks at both Springvale and Grindstone studios (where it was also mixed by Scott Atkins), Suffolk, the album is testament to the longevity of The ‘Filth, as not only does it reek of Cradle’s (feared or revered) brand of delicious metal vamperotica, but this thoroughly modern album places the band firmly in fresh killing fields anew. Cradle of Filth is also set to spread their darkness upon European lands with a tour throughout November & December.